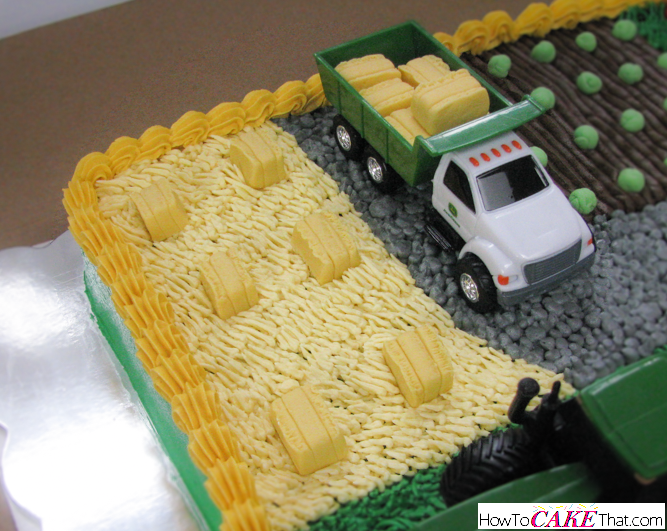 Springtime is certainly the busiest time of year for me as far as cakes go! Weddings and birthdays and graduations... oh my! 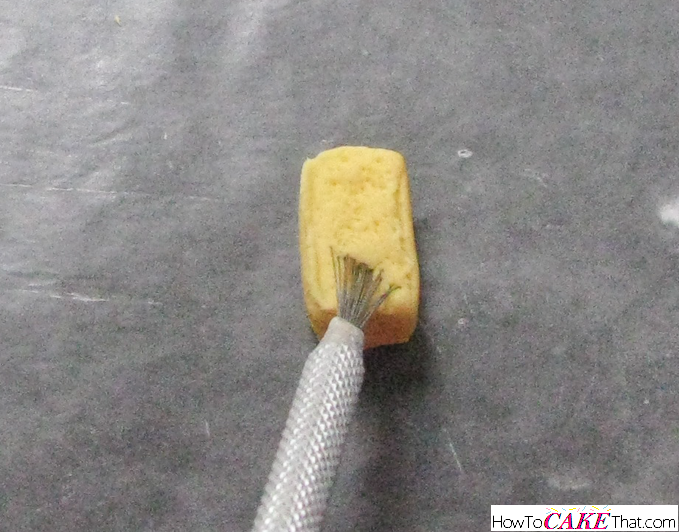 So while I'm putting together my latest cakes I try to figure out what kind of easy tutorials I could create from these cakes and snap a few pictures of the process. 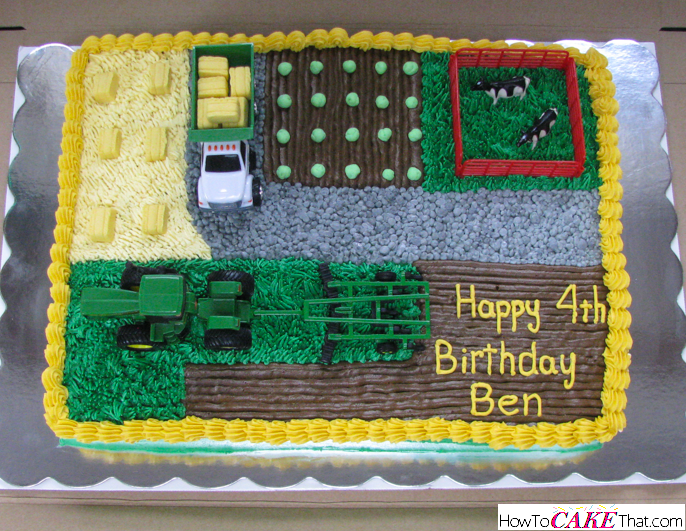 This past weekend I made a tractor/farming theme cake for my sweet cousin who turned 4! I was in love with this theme because first of all it required a lot of little details, and second, I grew up on a farm and it reminded me of many summers getting excited about "hay day", where we would drive pickup trucks with trailers and the big old red farm dump truck through my parent's backyard and through the pond field throwing and stacking hay. We then would drive it up to the barn and fire up the hay elevator to lift the hay into the loft... from there one or two of us would work quickly pulling the bales off of the elevator as they came up, passing them to whoever was waiting to stack them. As a kid, my job would be to scoot the bales across the floor to someone who was strong enough to lift and stack them, but in my teen years as I got older and stronger I was allowed to help with the more difficult tasks. At 40 to 80 pounds a bale, moving hay is no easy task, but I enjoyed every moment of it (and still do!). Our family really comes together during these times - aunts, uncles, cousins, neighbors and friends - to all labor on the hottest days of the year together, helping out my mom and dad on the farm. And every year, once all of the hard work is done, the best reward came: Mom would fix the best tasting country-style meal ever! And we would all sit around on the picnic table and on tailgates to eat and enjoy the time together and of course the delicious food! Nobody cooks like mom does! We still have hay day at the farm, but the farm is smaller and doesn't require as much hay as it did when I was younger. But I still look forward to it just as much as I did then, and family and friends still come together to help out. Yesterday my family and I spent the day on the farm for Mother's Day and I noticed the hay grass is growing and getting taller! It won't be long before it will be ready to cut and we'll come together for another "hay day". 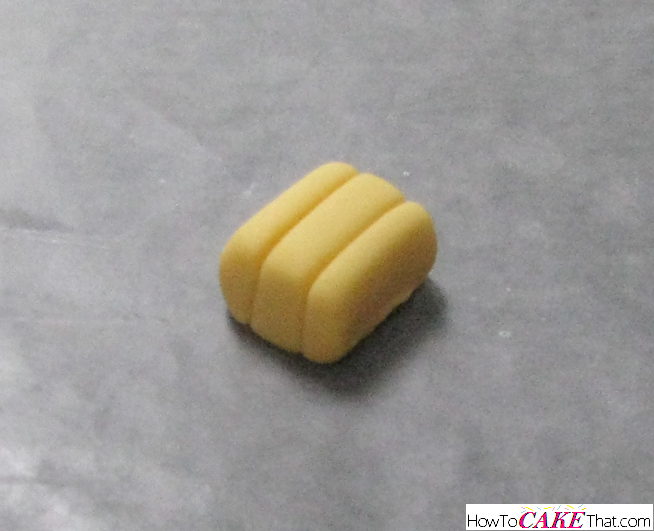 To begin this tutorial, I colored a small amount of fondant light yellow using Wilton's gel color in Buttercup Yellow. 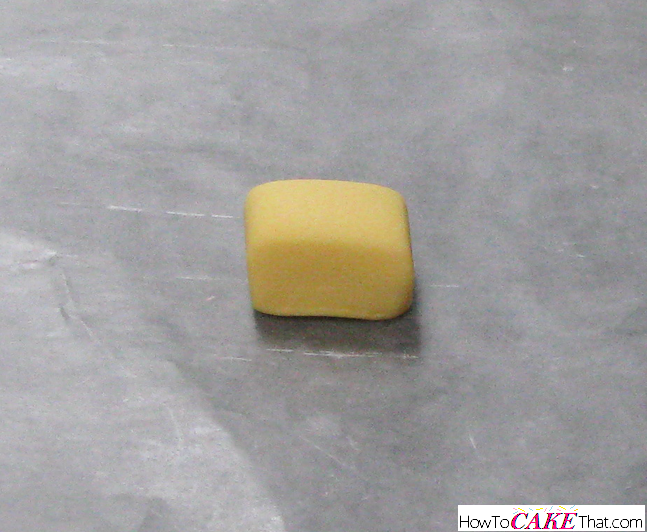 I then placed the ball of fondant onto a sheet of wax paper. 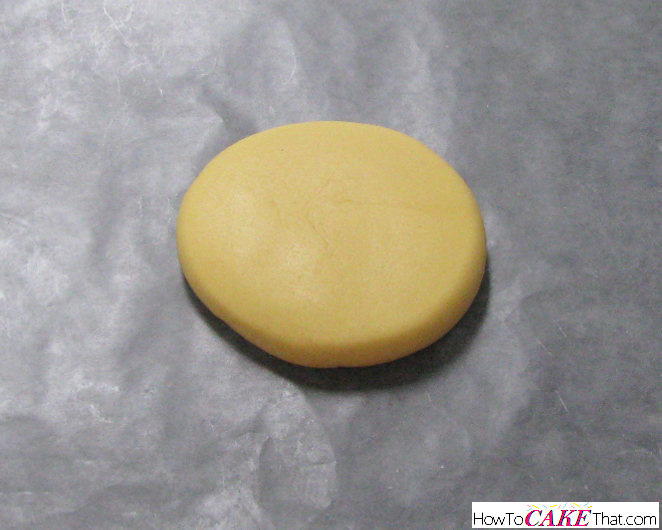 Next, I used a fondant smoother to press onto the surface of the ball of fondant to flatten it until it was 1/2 inch thick. 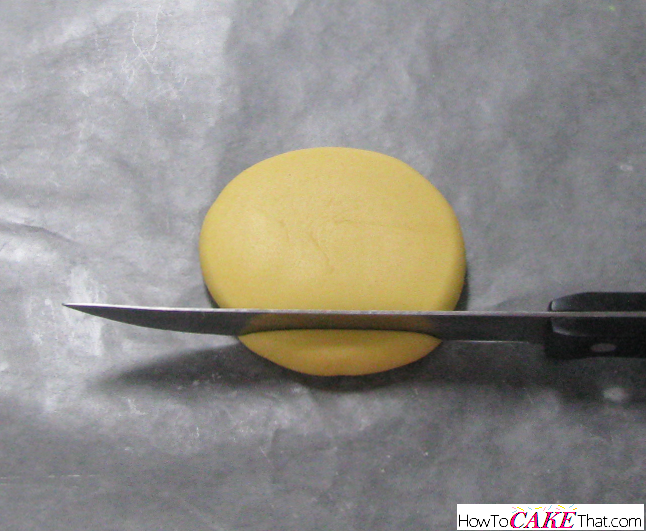 Next, I trimmed a straight edge on the bottom of the fondant circle using a sharp knife. 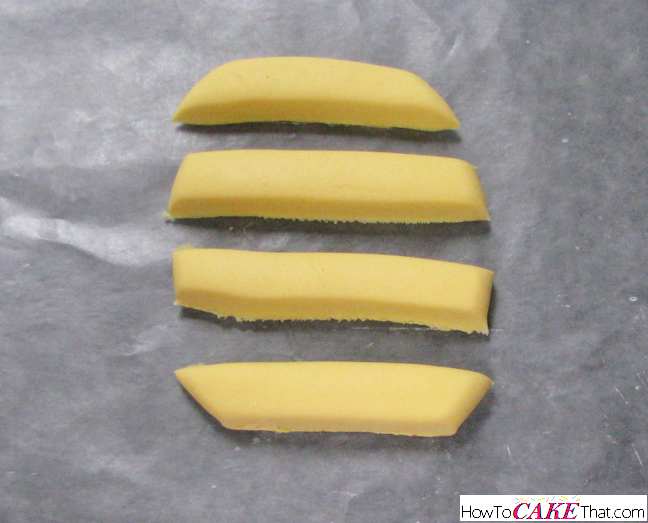 Next, I cut the fondant circle into 1/2 inch wide strips. 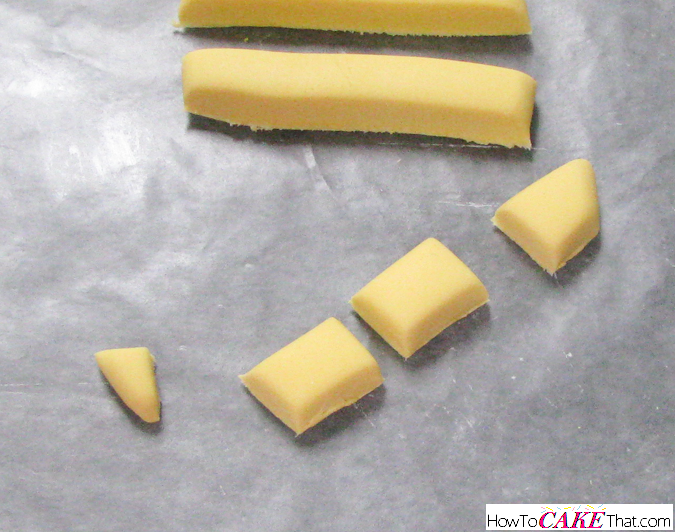 Next, I trimmed off the pointed end of the strip, then cut a couple of rectangular shapes out of the strip of fondant. 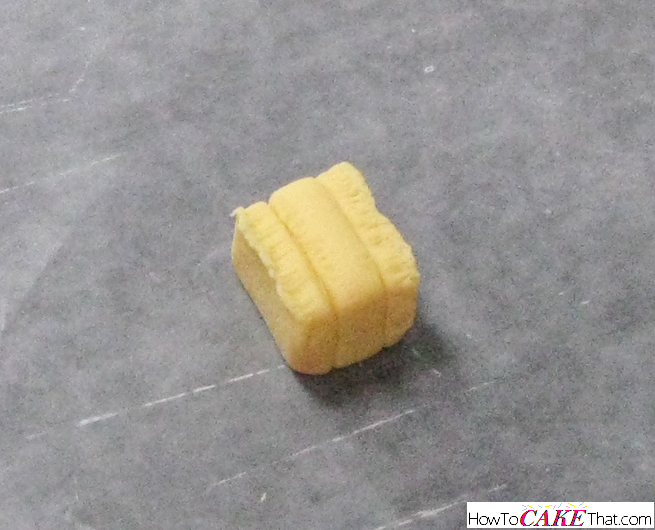 Set pointed ends aside, they can be kneaded together and rolled again into a ball to make more bales later. The bottoms of your hay bales may be a little wider than the top of the bale from where they were trimmed. 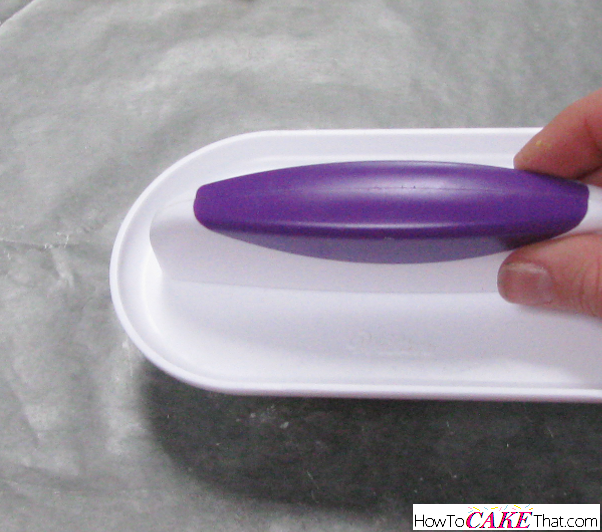 If so, use your finger to press the edges back in place so you have a nicely shaped rectangle. Now it's time to mark places where the twine would be holding the bale together. To make the "twine", use an Xacto knife and press the blade lightly into the top of the bale until it makes a deep enough indentation to look like where the twine would be. Be sure to roll the Xacto knife blade down the ends of the bales to make it look like the twine goes all the way around the bale. Don't worry about the underneath... no one is going to see that part. To give the hay bale a realistic fringe around the edge, I used a wire tip veining tool (if you need one, check out SugarDelites.com! They have them!). To use this tool, press your index finger onto the side of the hay bale to hold the bale in place. 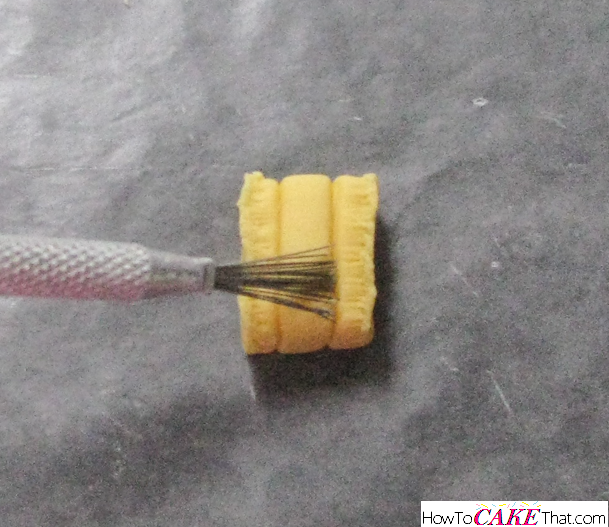 Next, press the veining tool into the fondant, just at the edge of the bale, at a slight angle until the tool meets your finger. 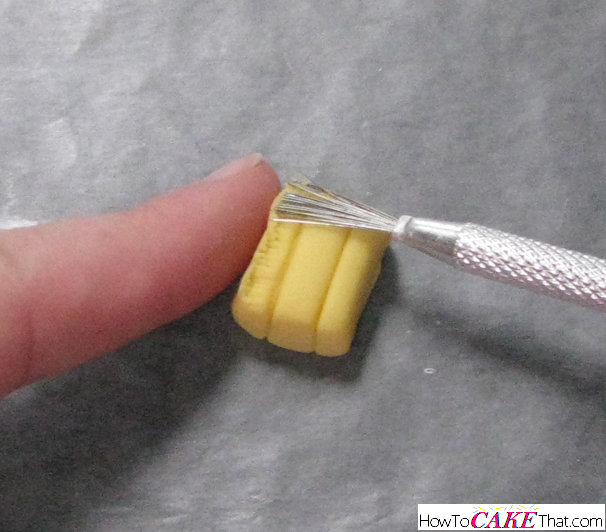 This tool is a little sharp, so be careful not to poke yourself ;). Be sure to do both sides and both ends. 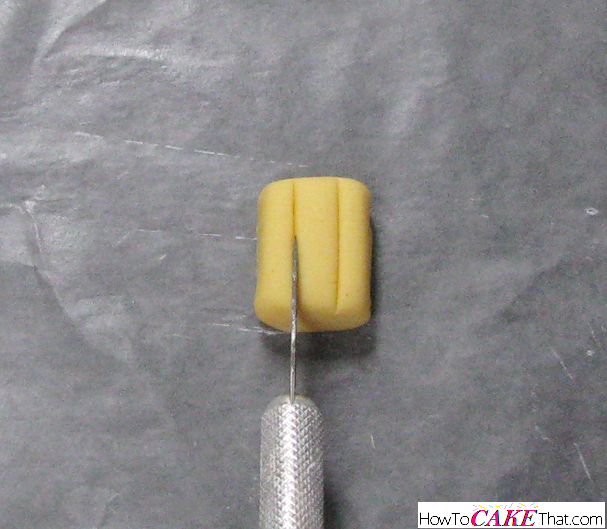 And to give the middle a little texture, press the wires at a slight angle to add little lines. Be sure to not press too hard in the center or it may flatten and you'll lose the nice realistic raised shape in the middle. And lastly, turn the bale onto its side and rough up the sides with the pointed ends of the wire veiner to give it some realistic texture. Isn't it too cute?! I want this made into a magnet for my refrigerator! Lol! I am a sucker for little miniature cute things! And all of the little miniature pieces just completed this cake. Kids especially love to have lots of things to look at. 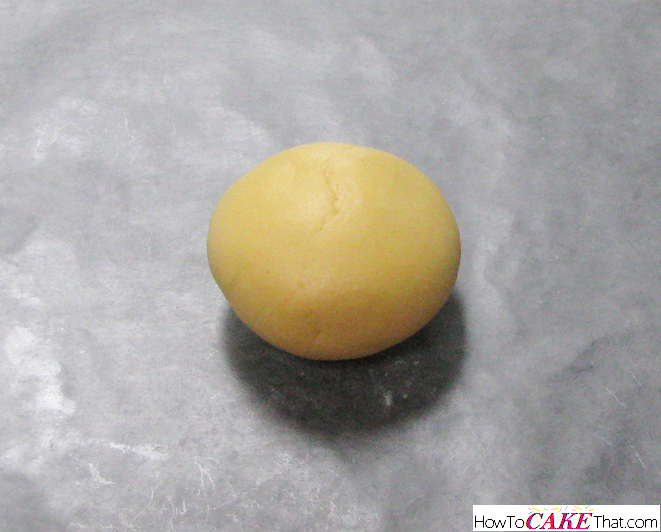 I hope you have enjoyed this tutorial! God bless! !